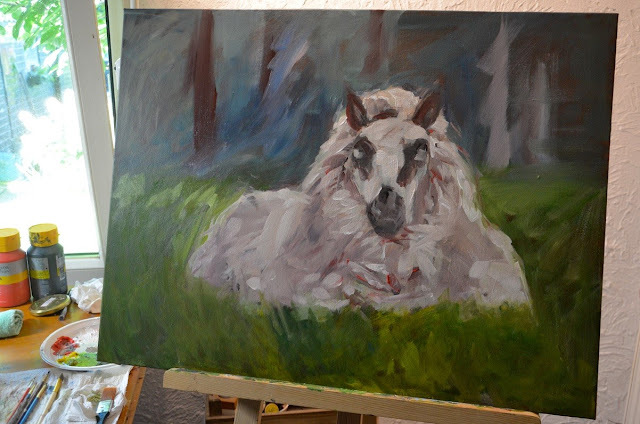 After Koetje (the goat) I wanted to do a large portrait again and contemplainted painting the free range pigs I took photos of a few weeks ago but I couldn't decide on a composition. When it itches it itches, so I started a portrait that was long overdue of our sweet Patsy who lived with us for 15 years and passed away almost two years ago now. Patsy was a diva, a classy lady and this image of her I've always treasured and is so iconic. I know that I'll have to work really hard to make it work as her body is foreshortened but believable in the photo, will it be too in my impressionistic style? It's a challenge I willingly take as this could be a worthy tribute to Pats. First set up, stay tuned! A day at the 'Tsjûke Wille' fair!